We live in a neighborhood where Mexican ingredients—fresh tortillas, cilantro, tomatillos, white onions, chilies, avocado and limes—are easier to find than a loaf of bread. So meals that we don't shop ahead for are invariably taco night. Leo is always cheerful at the sight of tortillas. And Diana Kennedy's salsa verde recipe, from her book The Essential Cuisines of Mexico, is so fresh and bright tasting, it makes a meal of pantry staples exciting. 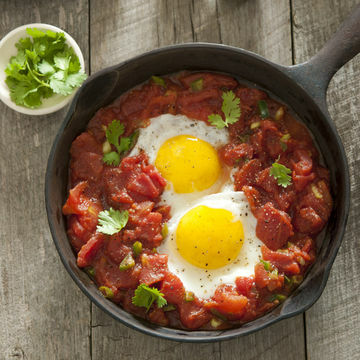 Hence, even though the salsa recipe isn't mine, and even though it's the only element of our family's huevos rancheros that we actually cook (other than fried eggs), I do feel you should know about this meal. It's not very photogenic, and when Leo is eating a fried egg in a tortilla with avocado and tomato, he isn't either. But I promise you it's all worth it: whether you need a meal at 9 am or midnight, this one never disappoints.